(CNSNews.com) - The federal government collected a record $736,274,000,000 in individual income taxes through the first six months of fiscal 2018 (Oct. 1, 2017 through the end of March), according to the Monthly Treasury Statement released today. The approximately $736,274,000,000 in individual income taxes that the Treasury collected in October through March of this fiscal year was $24,473,780,000 more than the $711,800,220,000 (in constant March 2018 dollars) that the Treasury collected in the first six months of fiscal 2017. 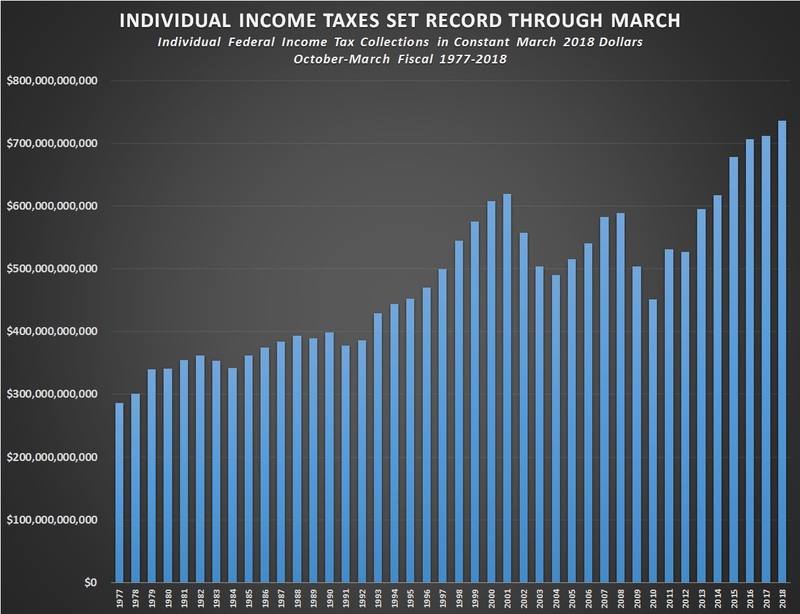 While the federal government was collecting record individual income taxes in the first half of this fiscal year, both payroll taxes and corporate income taxes declined compared to last year. In October through March of fiscal 2018, the federal government collected approximately $560,407,000,000 in Social Security and other payroll taxes. That was $3,210,000 less than the approximately $560,410,000,000 (in constant March 2018 dollars) that the federal government collected in Social Security and other payroll taxes in October through March of fiscal 2017. In October through March of fiscal 2018, the federal government also collected approximately $78,607,000,000 in corporation income taxes. That was $23,992,230,000 less than the approximately $102,599,230,000 that the federal government collected in corporation income taxes (in constant March 2018 dollars) in October through March of fiscal 2017. With the $23,992,230,000 cut in corporation income tax revenues between last fiscal year and this fiscal year, the federal government’s overall tax haul in the first six months of this fiscal year declined compared to last year—even while individual income tax payments were increasing. In the first six months of fiscal 2017, the Treasury collected $1,507,935,630,000 in total taxes (in constant March 2018 dollars). In the first six months of fiscal 2018, it has collected $1,497,005,000,000. While taking in those $1,497,005,000,000 in tax dollars, the federal government spent $2,096,713,000,000, thus running a deficit of $599,708,000,000 for the first six months of the fiscal year. 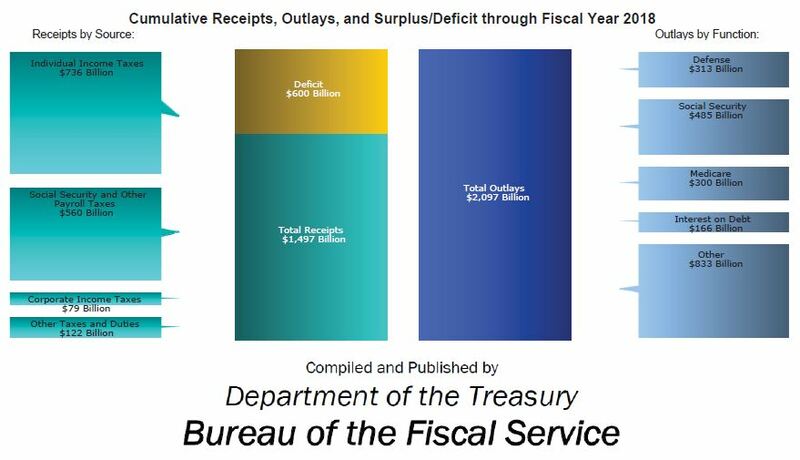 That is $60,419,720,000 more than the $539,288,280,000 deficit (in constant March 2018 dollars) that the federal government ran in the first six months of fiscal 2017.